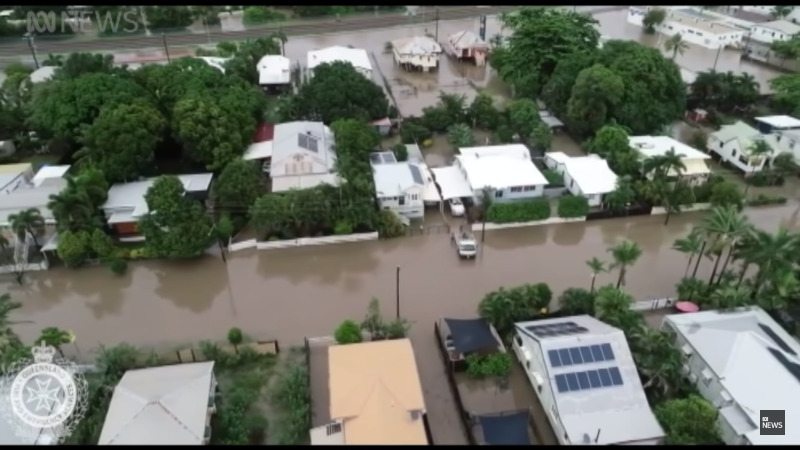 Flooding in Townsville (screenshot via YouTube). I STILL ENCOUNTER people who say "there’s always been climate change". They mean: don’t worry about global warming, it’s not our fault and there’s nothing we can do about it. You hear other excuses, too. So, should we not worry about the Reef and the rivers, about Townsville, about Tasmania, about the kelp forests and the mangrove forests and the many other symptoms of a climate awry? Do the "sceptics" think the scientists haven’t thought of all the "reasons" they find to ignore global warming? Evidently so. But of course, the scientists aren’t quite that stupid. They have thought of all those possible ways out of the conclusions, and a lot more besides. They’ve checked them all out. They don’t work. Global warming, caused by us, is still there, pretty much on the course predicted decades ago. Except that it may now be accelerating. Not only does the warming correlate with our greenhouse gas emissions, the atmosphere is also warming in the way you’d expect and the actual imbalance of heat coming in versus heat escaping back to space has been measured. The evidence is abundant and of many kinds, both direct and indirect. There is no wiggle room left. Global warming is real and we are the cause. Many of the people who resist that conclusion may actually be worried that our society might change drastically, that we’ll regress to living in caves or something absurd like that. But we can have clean energy and we can fix many of the other problems while maintaining a comfortable life, even improving it. Unless, that is, we fail to change what we are doing. That is by far the biggest risk of regression, even collapse. Writer Richard Flanagan has called them out. You may have noticed that I haven’t been saying "climate change", I’ve been saying "global warming". The latter is the more accurate term. Even more accurate is "anthropogenic global warming", human-caused global warming. Such is the power of those who manipulate our society that they deliberately changed our language, so most people now say "climate change". It’s then an easy step from that phrase to "there’s always been climate change". It’s true there has always been climate change, but you might not have wanted to be around for a lot of it. Most of it was very slow, but even that caused many extinctions. The more rapid changes, triggered by big volcanic eruptions or meteorite strikes, caused mass extinctions. The present change is very rapid compared to most, and we are in the early stages of what can become a mass extinction unless we rapidly change our ways. Do you wish that risk for your grandchildren? An irony is that we’ve had 10,000 years of remarkable climate stability during which our vaunted civilisation has arisen. The present global industrial system is extremely fragile and will very likely collapse into simpler forms even if we do pull back from the flames. Some form of "civilisation" will probably continue, but it’s not clear what. Meanwhile around half of the Great Barrier Reef is dead. Surely you’ve heard that? The thing almost no one says is that global warming has momentum, it will continue for several decades almost regardless of what we do. It’s hard to see the Reef being more than a small southern remnant after that. Several summers ago, we also lost vast tracts of mangrove forests across the north and vast kelp forests off the west coast. Now the ancient alpine heaths and Gondwana forests of Tasmania are burning. They haven’t burnt for thousands of years and they won’t easily recover. The Darling River and the Coorong were in big trouble during the millennium drought and now there are mass fish kills. Our land is dying before our eyes. It is reverting to simpler, harsher forms. Many suffer now, and our children will suffer more. Our firefighters and disaster managers, the ones who work on the ground, are speaking very clearly: we are experiencing unprecedented heat, floods and fires. It means we are in the early stages of a vastly greater calamity. We don’t know if we can turn it around, but if we don’t try it will come upon us remorselessly. As this angry summer proceeds, reflect on what is really important. Do your tribal political affiliations really amount to much? Your vote is your power. If you use it the same old way you’ll get the same old result. If you want something better you have to change your vote. Dr. Geoff Davies is an author, commentator and scientist. He is a retired geophysicist at the Australian National University and the author of Desperately Seeking the Fair Go and The Little Green Economics Book. He blogs at BetterNature Books.